When I first came into possession of the 200 negatives that comprise the Capewell Glass Negative Collection, I knew next to nothing about them or who the people were in the photographs. As time went on, I assembled evidence sometimes haphazardly and had a lot of help from the readers of these posts who have been very generous with information. Sadly, this is one of those photos of which I know nothing. These people may be relatives of Westville, New Jersey’s John B. Capewell or possibly neighbors. It was part of the collection pictured above, and I have little doubt that Capewell shot it. It maybe shot in Westville. I don’t know. Hopefully somebody out there recognizes one of the folks here as a relative. 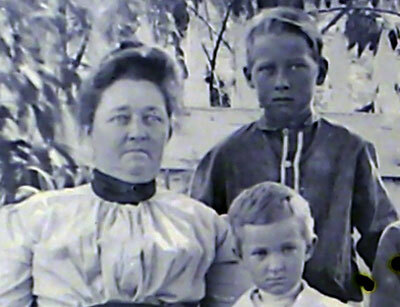 One thing is for certain, if these seven boys were brothers and the woman was their mother, there was ample reason for the woman’s frown and thousand-yard stare. 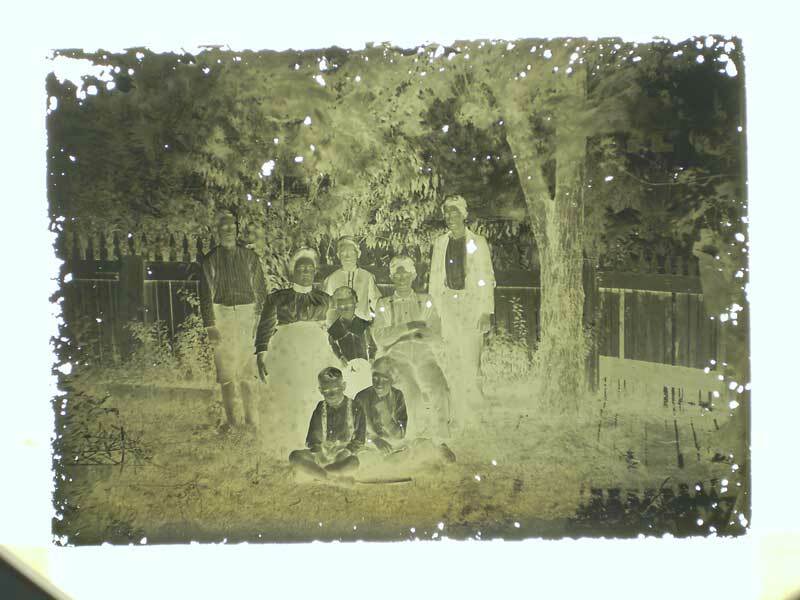 As with all of the photographs in theÂ Capewell Collection Glass Negative Collection,Â I placed this 5â€³ x 7â€³ glass negative on a lightbox and shot it with a digital camera locked down on a tripod. TheÂ â€œprocessingâ€Â was done digitally on a Mac usingÂ Adobe Photoshop. This entry was posted in The Capewell Glass Negative Collection and tagged analog, antique photography, glass negative, John B Capewell, New Jersey, photography, Photoshop, The Capewell Glass Negative Collection, vintage. Bookmark the permalink. I really do not have much to add except to say that it appears the yard backs up to Big Timber Creek. You can see the water in the background. Good eye, Jerseyman! Thanks again! Update to who they are. 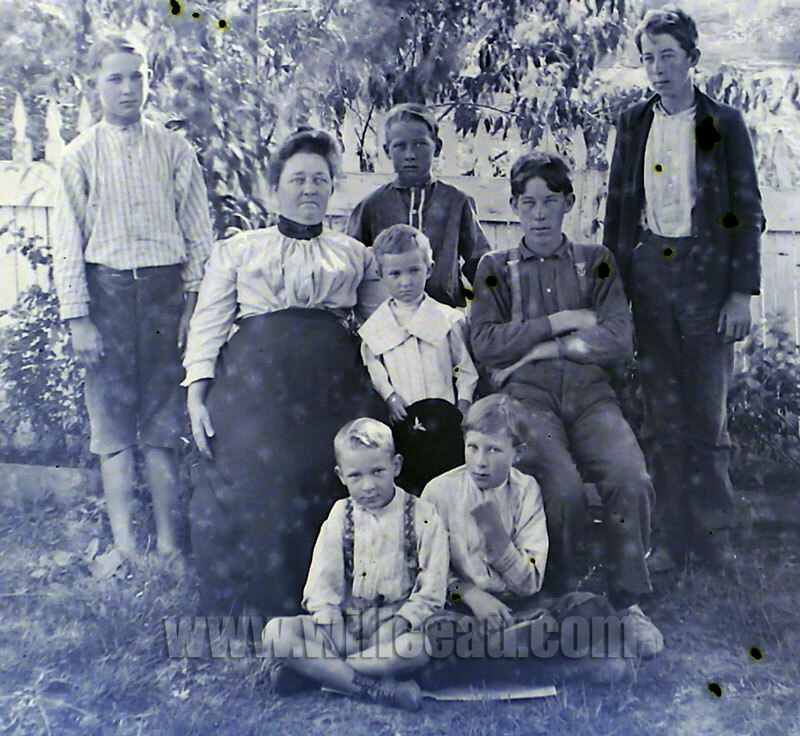 Top left is Robert Ross sitting is Helena Evans Ross (Ella Capewell s aunt) than George Ross center back . Oldest boy is James a Ross Jr. Next to him is William Francis Ross (who is being honored this veteran’s day for the 100th anniversary of the end of WW1.) Left front is Donald Ross and next to him is Charles Frank Ross. 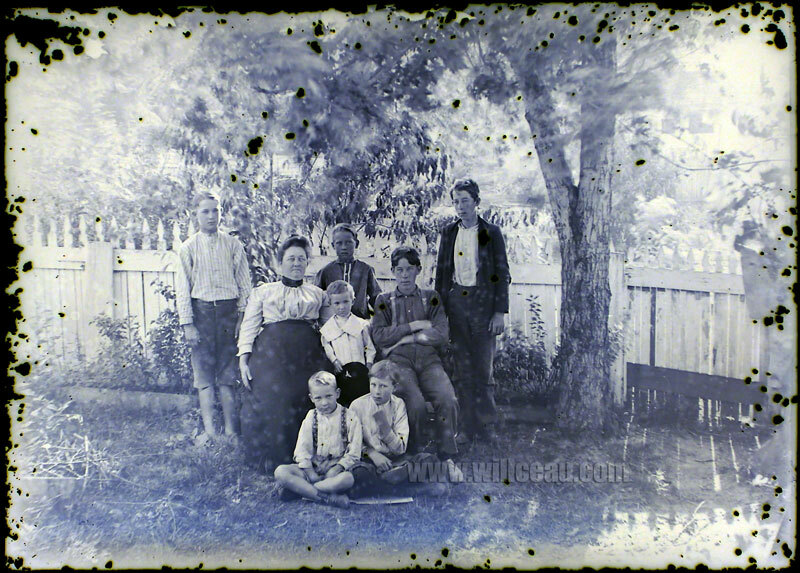 The picture was taken at there home on the Sassafras circa about 1904 or 5 since Tom was born in 1901. Missing from picture. Would be the father James Sr. And my great grandfather John who was the oldest. Also a daughter birdie who died at 3 of pneumonia in 1898. I figured this information would be forever lost. Thanks for proving me wrong! Honestly it took me all this time to figure it out. Thank you again for keeping all these negatives, and reproducing them. Our family is forever greatful. In going through pics I actually found a very faded version.of this pic. Plus I get my features from this line .